This demo is a little more elaborate than we'll learn in this tutorial. It uses the geolocation of your device (exact location on GPS enabled devices, triangluated location or IP based on non-GPS devices). 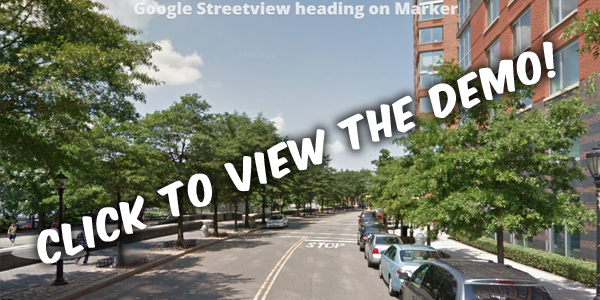 To create this, you'll need an element on your page that will contain the Streetview element. Add a DIV with an ID of "streetview" to your page. I used an element with a 100% height, but you'll probably have other elements in your page, so you'd better fix the height at something like 300 pixels. 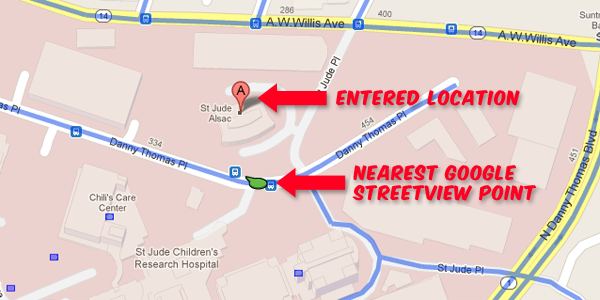 Location A is the location we enter in the script, and the second locaton is the nearest streetview point. This is enough to let the API calculate the heading of the streetview camera. At first, we'll need to add the initialize function to the onload eventhandler of the page. This has to be done to execute the function after the page finishes loading. As you can see, the actual calculation of the heading and setting this to the streetview camera is not very complicated. Al the geocoder stuff and all of the "if nothing was found" checks take up most of the lines of code. Thank you man - that's exactly what I was looking for! This is a totally awesome article, thank you! Yeeeeeey, thank you! Geolocation for me is not working with this tutorial - seems to just find a building called the solaire...? The demo works but the tutorial code does not. How do I get the geolocation to work for street view like the demo?